As I reflect on the events of 9/11, I remember getting off shift at the firehouse that morning at 8am. I left to go to a wood flooring job site at a police Lieutenant and friend of mines house. His wife was home working in her home office. I was installing a new floor in their home. I was a new member to the task force, about 9 months or so on the team. I had been associated with Macedo, Gomes, Kenney, Bates, Better, Fay, Clarke and Clark through Mike Mansfield at the NH Fire Academy as Jess Wyman and I were new additions to help support the Rescue Systems Program at the Academy. That Morning as I was installing flooring my buddies wife came down to tell me a plane just hit the WTC. I stopped what I was doing and went to check out the TV and saw the massive fire. As I was watching the TV I watched as the live footage captured the second plane striking the second building. Then the reports of the crash at the Pentagon. I had been involved in alot of terrorism training at the time and had just three weeks before that date returned from New Mexico from the Incident Response to Terrorist Bombing course in Soccoro. One week prior to 9/11 I was in NYC with my oldest daughter who was 9 at the time, we visited Ellis Island and the Statue of Liberty, of which I took a picture of her with the backdrop of NYC in the background (which was actually the Towers). And for the first time I actually drove by the Towers during that trip, but do to a long day we did not tour the Towers. I remember watching in awe as we all realized we were under attack. As I watched live the first collapse all I could think about was “holy crap”, we just witnessed alot of firefighters perish. I remember feeling in shock watching the TV. Then my phone started to ring. Guys from my firehouse were calling me asking if MATF1 was being deployed to NYC. I was so caught up in watching the TV I guess I never realized the reality of the situation and that I needed to call the cache. I was in logistics at the time as all new task force members used to be. I remember calling the cache and was told to come in, we needed all the help we could get. I had nothing packed as I never planned on being deployed as anew member, heck I didnt even have any of the gear needed. I left the jobsite not knowing when I would be back. My buddies wife fully understood. I got home and threw together what I had for gear into a bag, explained to my ex-wife that I was headed to Beverly to put the TV on and I would call as soon as I could to explain more. I like many others never had a chance to say anything to my daughter as she was in school. I headed to the cache to help in any way that I could. Once I got there I was put to work pulling all our boxes off the racks, there were only a few people at the cache at this point, I didnt know too many people that well, but teamed up with John Forristall pulling boxes. Everytime anyone asked what we were taking for equipment, someone else yelled out, “take everything, this is the big one”! We were all still in shock at what was going on, yet everyone kept working like a well oiled machine. I pretty much knew I would not be going on the deployment to NYC as I was still very new, but I was very proud to be part of the team and what ever role it was I needed to fill to get them out the door to the scene to help. As the team left, it was dark. All the commotion at the cache was no silent. The few of us who were back at the cache went and watched the TV to keep watching the updates. I remember returning home that night and my daughter woke up when I walked in the door around midnight and came downstairs. She asked me if she was going to be safe, and if any firefighters died. I think it was at that point that I finally broke down, telling her, “yes Shannon, alot of people died today”. And I promised her that I would always keep her safe. In the days following I filled many of the night shifts at the cache, answering the phones and updating the logs. I remember answering the phone on a many occasions when family members, spouses etc… were calling checking on my teammates, their family. And I was happy to report whatever I knew and that everyone was doing fine considering the work that they were doing. Upon the teams return from NYC I was there and have to say, even though I did not respond to the scene, I was very happy and proud to be a member of MATF1. Since that day I have participated in alot of training all over the country with some of the best, but I can truly say without hesitation that we have the best, most dedicated and skilled team and members of any team in the country. I am proud of the men and women who responded that day and represented MATF1 and did the fine job they did. 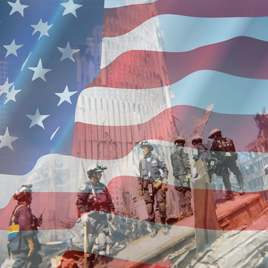 God bless all that lost that day and God bless our team MATF1.